Quidditch is dominated by collegiate teams. Nearly all colleges have at least one major event or online directory where students can view registered organizations. This is great for bringing together students and is a great help for recruiting. College students, many of whom are fresh off high school athletics, fit practice in after class at their institution’s local field or park. Without ever attending a practice, students are filled with a sense of school pride and excitement of bonding with other students. However, students graduate and move, so how does a community team form, where are they now, and where will these teams be in the future? Currently, there are well over a dozen community teams across the United States with more internationally. This is enough to grab the attention of Quidditch Quarterly, as well as for networking groups to start forming specifically for community teams & mercenary players, including my database over at From The Keeper Zone. Some of these community teams were founded by students who played in college, and some by players who didn’t have the chance to play in school. Emily Crouch had the unique opportunity of playing for two community teams, one of which she founded. Such stories are likely to become more and more common in the future. With a sport so young, quidditch players recognize that importance of recruiting and retaining players, even under roster restraints. When it comes to recruiting for a community team, Santiago Gonzalez – an Emerson College grad and current member of the Lost Boys – feels it’s important to keep your mind open to new recruits early on. Everyone is open game for community team recruitment, whether as a player, fan, someone just willing to help with the logistical side of things, from finding playing space to getting equipment. Crouch also suggests major public advertising through practicing in open visible areas, doing 5k walks, working with public libraries, anything that you or your team can volunteer for or host to get your team’s name out. Anything involving kidditch will do a lot to attract local news media, which can help get the team noticed more by the community. “Keep an eye out for community center opportunities, day cares, public school events, even Vacation Bible Schools at local churches,” she continued. “Whether you’re religious or not, many larger community churches are always on the lookout for fun game time activities for the kids attending.” When talking to people about getting involved with the team, realize that there are a wide variety of reasons someone might want to get involved. Whether it be reliving being a part of an athletic team, the love of the sport’s origins, making new friends, or living a healthier lifestyle. Out of school, the players don’t live down the hall from each other. With many schools, the off-campus players still live within a walk or quick bike ride of campus. This, combined with social media, can help collegiate teams make short notice changes to practice schedules leading up to tournaments. For a community team, this can be more difficult. A community team takes more discussion in order to maintain a consistent practice schedule than school based teams, but with less flexibility comes more consistency. Most of a team’s players won’t have to deal with exam weeks taking up all of their players’ time or losing fields to other campus events. Community team life is not all doom and gloom compared to collegiate teams. A community team has the freedom to go in any direction with their logo, uniform, and team name. “Our captains usually give us a couple options and we decide all together for basically anything,” Gonzalez said. The number of community teams grows every year. There are groups of players from a mix of different schools and communities that come together for pick up games, members of communities looking to discover and play the sport, and teams hoping to compete with top echelon teams from across the world. For collegiate players hoping to continue playing or snitching after college, there is a lot of potential for new and existing community teams to grow. However, you shouldn’t expect the same practice andplaying environment. “When making the transition from College to Community the key is to remember that what team you play for is just as important as the desire to keep playing,” Gonzalez said. Of course, the biggest boon to the future of community teams might be the performance of the Lost Boys at World Cup VI. There, the team proved they can hang with even the best college squads, putting up a perfect pool play record before making a run to the quarterfinals, falling just short against Bowling Green State University. It makes sense that the community teams will slowly grow to be the sports elite, and the Lost Boys took the first steps in April. 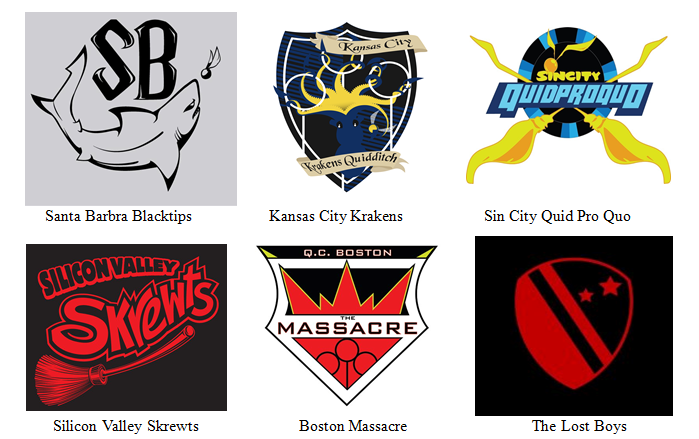 The quidditch community is always looking to help the sport expand, and there are already rumors of community teams organizing a community team World Cup in Las Vegas, NV. With double digit community teams formed in the few years of the sport’s existence, it isn’t farfetched to see a major tournament made of non-school affiliated teams in 2014. With the help of the online network of quidditch players, snitches, refs and coaches, quidditch will continue to expand, so there is plenty of support and advice if you need help fund raising, are looking to join a community team, or looking to start your own team. Post-collegiate quidditch is in the future of the sport, and will exist for every player looking to play when their academic careers are over.